People living in RV or need some portability in power supply can really use generators. Energy is never created, it just changes its form. So you need to provide some kind of fuel which is converted into electricity by generator. For people who are on the move or need more flexibility can buy dual fuel generator. Dual fuel generator allow you to use two most common fuels propane and gasoline. It provides you the freedom to get power-supply even when any one of them is not available. We are so depended on electricity that you just can not imagine your life without it. Sometimes having one of the best dual fuel portable generator in your home can resolve sudden blackouts. You just need to feed the gasoline or propane which ever is available. 1 Why To Pick A Dual Fuel Portable Generator? 15.1 Why to use dual fuel generators over gasoline only? 15.4 How much power do you need? 15.5 Can they provide power to my whole house? 15.6 How fuel efficient are they? 15.7 Apart from being the backup generator what else can you use it for? Why To Pick A Dual Fuel Portable Generator? Generators with dual fuel feature are more efficient because of they can generate electricity or power on two different types of fuel inputs. They can use gasoline, propane, diesel, or natural liquid gas as a source to produce power. Let’s assume there is a power outage and you are not near to any gas station? then in such situation generator powered with multiple fuel can be very much useful. You can fight back the darkness. No matter what, you can always use it as backup generator to prevent unwanted power outage. Having one of them in your home will reduce any risk of complete blackout as some of them can run for 20 hours. Champion has been producing one of the most reliable portable generators from more than half century now. Just unwrap the latest 3800 watt compact generator and it will work perfectly on GAS or Propane. The 224cc 4 stroke engine will make sure that your fuel is properly utilized and help you power your small apartment or take it on ride with your RV. Champion 3800-watt dual fuel generator single cylinder engine is air cooled to improve the engine lifespan. In addition to that, it has automatic low-oil shut-off feature which stop the generator from producing more power when the oil is low. So no sweat there few !! Moving on, what is more to convince us that this one is the best dual fuel generator to buy. Gone are the days when we use to pull a electric cord in order to start the engine. Now you can just power your house with constant 3800 watt of power supply with just one electric start button. When you are spending money behind power house or on dual fuel backup generator then it is important that you keep durability in mind. Therefore, in case of this Champion dual fuel generator the whole power source is kept under a cast iron case which makes it durable and rigid which will last for long time. 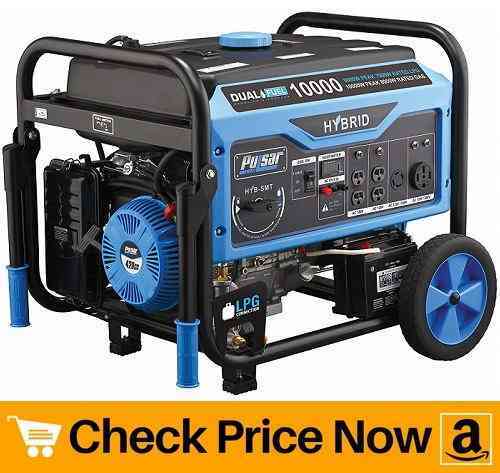 While all these feature makes it in the top position in our generator review list, but as the product is designed and made in USA gives it another layer of trust and enhanced credibility. Why You Should Buy Champion 3800-watt Dual Fuel Generator? Dual Fuel Engine able to generate power on GAS or PROPANE . Bottom Line: This unit is the best dual fuel generator you can buy because it is economical and completely value for money. Powerful 7 HP engine makes DuroMax XP4850EH another best dual fuel generator. At peak it can deliver 4400 surge watt and then a constant supply of 3500 watt of power. You can choose between Gasoline or Propane to fuel your generator for generating power. At half the system load you can expect it to run for 7-8 hours for small house or during camping. It comes with the common household plug which make the connectivity very easy. Apart from being one of the best dual fuel portable generator, it is very travel friendly. Make less noise and can be brought on camping sites. DuroMax XP4850EH is protected under the iron cast heavy duty frame which increase its durability several times than other cheap generator. It is EPA approved which means that it is safe for National Parks and the features are CARB compliant. Both these safety certification back the product quality in total. DuroMax XP4850EH digital panel let you manage the fuel consumption rate, low oil warning lights, and hold key start switch. With only 69 decibels of sound, this DuraMax unit is one among good silent generator that is powered by Gas and Propane. 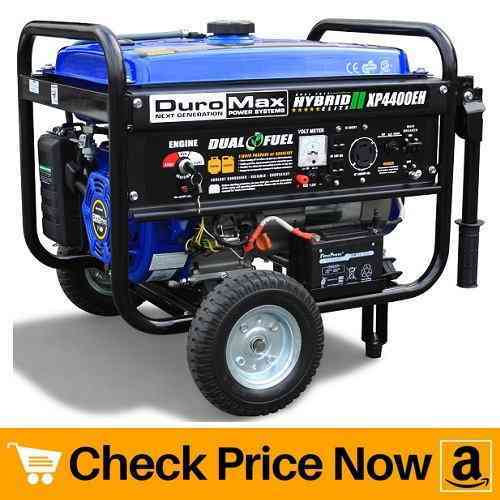 Why You Should Buy DuroMax XP4850EH Dual Fuel Generator? Longer Run Time: Dual Fuel Capability Allows for 20 Hours on Propane or 8 Hours on Gasoline. Bottom Line: The best silent generator to buy when you are on budget and looking for durability at the same time. 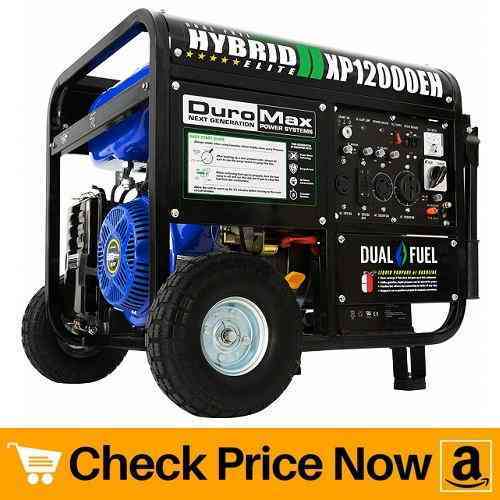 There is no doubt why DuraMax XP12000EH is in our best dual fuel generator review list. With more than 80 percent positive feedback on Amazon, it is widely loved among the consumer. The overall compact design and powerful 12000 watt generator can be your next home power backup. DuroMax XP12000EH is a beast generator which is not limited to GAS only. The latest dual fuel technology allow consumer to run this unit on both GAS and Propane. In our opinion pick Propane as the fuel every time as it runs twice compared to gas. This 12,000w of power will provide you with the comfort to weather any storm! this dual-fuel, gas or propane fuel source generator can run-up to 20 hours on propane which will give you the longest run time & minimize maintenance from gasoline emissions. DuraMax XP12000EH is powered by a 457cc DuroMax OHV engine that feeds the fully loaded power panel which allows the user to pull-up to the maximum 12,000W of power. Why just use it as backup generator when you can carry it on your large RV anywhere. 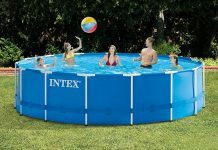 Yes, this unit is EPA approved for 50 states which makes it very portable. Why You Should Buy DuroMax XP12000EH? Bottom Line: It is the Amazon choice product in its class due to top customer ratings, multiple seller discount and offers. Having a small and compact generator which is powered by dual fuel is always a good idea if you live in States with frequent power outs. 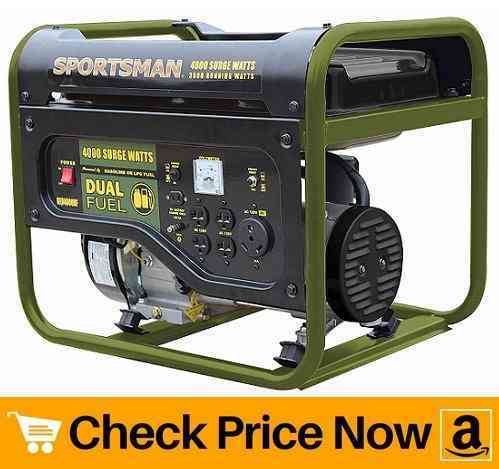 Sportsman GEN4000DF dual fuel capable, operates off Propane or Gasoline life easy in blackouts. We recently suffered from several natural calamities which left our cities without any source of power. Power generator like Sportsman GEN4000DF can be really helpful with its continuous 3500 watt power supply. It is an amazing product or say must have things when you go out on road trip. Great for running the RV while out on the road. Alternatively, popular among tragedy states for running essential appliances during power outs. You can either pump it up with clean fuel like Propane or it runs smoothly on unleaded gasoline too. So what exactly you can expect from this Sportsman Dual fuel series generator? Thanks to powerful 7 HP engine, with 4000 peak watt and 3500 rated watts, it is one among the best and powerful portable generator perfectly suitable for homeowners, recreational activities, and moderate contractor. So just being compact does not mean a power source is portable. Then what else do you need? Sportsman GEN4000DF has four 120-volt outlets and a 12 volt DC outlet for battery charging. In addition to that, if you are planning for camping or tailgating then it is also equipped with another single 120V RV outlet to power your outing happiness. Why You Should Buy Sportsman GEN4000DF Dual Fuel Generator? Bottom Line: With all its feature and amazing properties, Sportsman GEN4000DF has become the Amazon Choice product. You can not ask for more in this budge, the price is very budget friendly and you get more than what you actually pay. Low noise is one of the major factor which make a generator portable and user friendly. Champion 4000-watt dual fuel generator comes with specifically built-in quiet technology which cut down the noise. How they have achieved the optimal silence? Champion has developed “Advanced Open Frame Inverter Design” which essentially reduce 50% of the noise and makes it 20% lighter than other conventional small-medium size generators. Not just that, Champion 4000-watts come with “Economy mode”, in our on-hand review we found that it saved 5-10% of fuel as compared to Champion 3500-watts engine. So, it is light weight, makes less noise, and saves fuel – This is the complete definition of a good dual fuel portable generator suitable for homeowners for backup and loved by campers. The company itself claims that it is RV ready, which means it has 120 V RV outlet for fast connection. In the matter of minutes you RV will be powered after connecting the generator. With 4000 starting watts and 3500 running watts it can run up to 17 hours on gasoline. Not just for tailgating or camping, it is equipped with two 120V 20A household outlets with clean power (less than 3% THD) and 12V DC outlet with dual USB adapter. So what if we need more power in future? Don’t worry Champion gives you the option of parallel connection. You can increase your power output by connecting up to two 2800-watt or higher inverter or digital hybrids with the help of parallel kit. Therefore, you know that you are not going to go out of power. 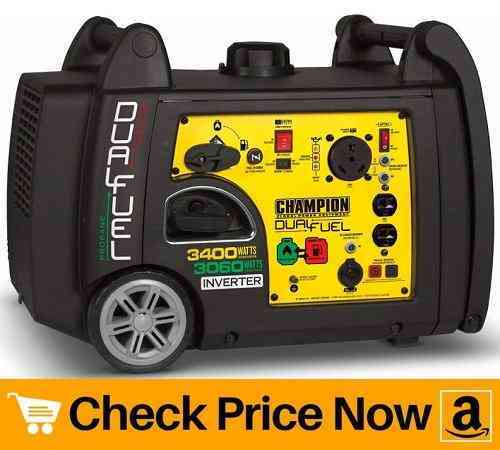 Or in need of more power, you can simply buy cheap generator from 2800 watt and connect it with Champion 4000. 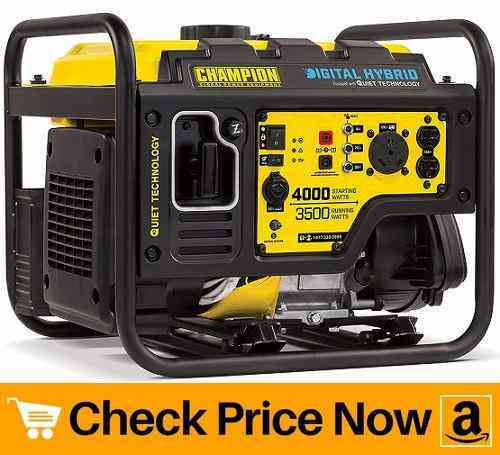 Bottom Line: Because of its light weight and quiet technology this Champion generator is being sold like fire on Amazon. 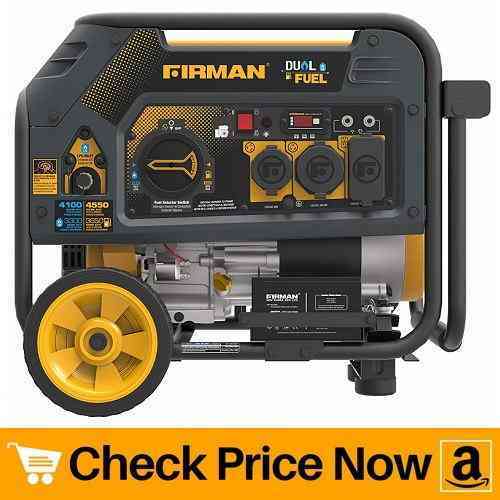 Due to strong and positive customer reviews and feedback it has become of the best dual fuel generator of 2019. Westinghouse WGen7500DF is another excellent dual fuel generator for home. With 9500 peak watts and 7500 running watts, you can keep your home all powered up during blackouts. It will be a perfect fit for any medium size apartment or house to full fill their power requirements. Being dual fuel generator, you can fire it up with either clean Propane or use unleaded gas. The ease of use becomes much more convenient with electric push button start with “Remote Key Fob” to manipulate the engine. During our review, we found that Westinghouse WGen7500DF has Twist-Lock Outlet (Common for Transfer Switch Hookup). It makes the connectivity much more easier even if you are using the generator for the first time. This dual fuel generator has 420cc Westinghouse 4-Stroke OHV engine that enable constant supply of power on both propane and gas. It also features automatic low oil shutdown to protect engine. Juicing out the power has never been easier, Westinghouse WGen7500DF comes with Intuitive Control Panel Features Two GFCI (Ground Fault Circuit Interrupter). First one is 5-20R 120V Household Duplex Outlets and another one is L14-30 120/240V. Why You Should Buy Westinghouse WGen7500DF Dual Fuel Generator? Use the WGen7500DF’s remote start key fob to start your generator conveniently from anywhere within range. Easily switch fuel sources from gasoline to propane while your unit is operating. 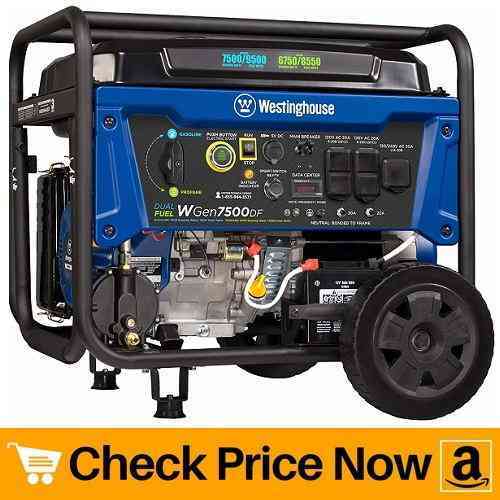 Bottom Line: The premium WGen7500DF Dual Fuel Portable Generator by Westinghouse was engineered to provide you ease and comfortability that every portable power solution should have. 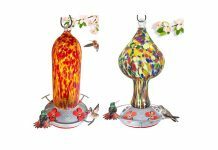 It has 1000+ positive customer reviews on amazon and is the current best product in its class. DuraMax have been developing one of the most affordable dual fuel generator from several decades. And DuraMax XP4400EH is another among them which is perfect for small apartments or just to have it as backup. If you are living in a large apartment, then this unit can help you power up essential home appliances, however it is perfect dual fuel portable generator for RV or camping. The 196 cc engine is capable enough to supplement the power need of a small house. It produces 3500 running watts and can be operated on Natural Gas or Propane. It has easy fuel switch through which you can shift between the fuels of your choice. Liquid propane gives you the upper hand while using DuraMax XP4400EH as backup generator, as propane can be stored for years unlike gas. For instant uses go with gas and keep propane as backup fuel to generate power during blackout. So how long it can create electricity for us? 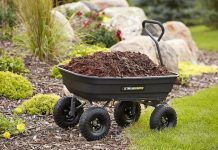 The compact size of DuraMax XP4400EH and the attached wheels on the steel frame makes it very portable and easy to carry on the back of your RV or camping truck. Even at greater load the RPM of engine is in control and creates less noise. It is widely used as a backup source of power for your home in times of power outages to run the essentials in your home. DuraMax has designed XP4400EH to be connected to a transfer switch which will instantly supply power to your home or appliances. Why You Should Buy DuroMax XP4400EH Dual Fuel Generator? Bottom Line: The Duromax XP4400EH portable generator is designed to run on liquid propane as well as gasoline. Being portable it can be moved where ever it is required. DuraMax XP series compact generators are affordable and value for money products. 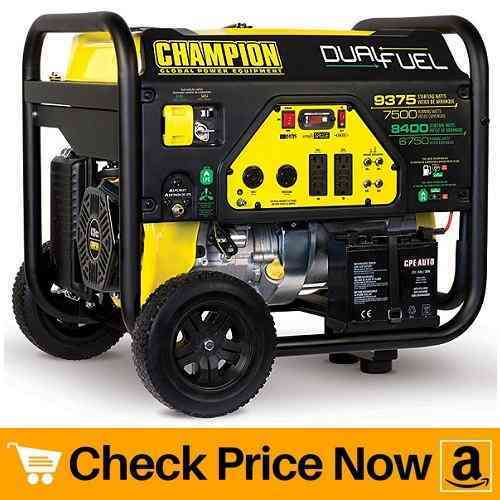 This champion portable dual fuel generator is simply amazing. You can use it straight out of the box. It runs on Propane and gasoline and has 7500 rated ac output which is enough to power a house. It also have 1.2 quarts of oil reserve, when touched the automatic low oil shut off process stop the engine. Thanks to the 439cc engine, Champion 7500 can power up your home appliances easily. It is another good backup power source that you can have in your home. Intelligent gauge will make sure to keep track of correct voltage and current output. 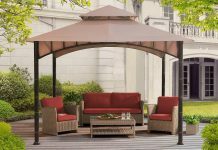 Champion has made sure that the power source is well protected under tubular steel frame that enhances durability. Safety Fuel Selector Switch keep the engine and you safe from any short circuit or engine damage. The brand has made sure to keep user protection into prime agenda, as this champion generator has GFCI protected outlets that prevent electricity bleeding. Why You Should Buy Champion 7500? Bottom Line: The Champion’s ultra-powerful 7500-watt generator with electric start features Dual Fuel, allowing the 439cc engine to run on either gasoline or propane. Full fuel tank will keep it running for 8 hours on gas and 5.5 hours on propane. Solid customer feedback has made it one among the best seller on amazon. If you wish to buy high end dual fuel generator which is also portable then Pulsar brand is a good choice. With 10000W peak and 8000W rated (gas)/ 9000W peak 7000W rated (LPG), it is really a powerhouse that can help you survive a full day blackout. Powerful 420cc engine is protected by strong powder coated steel frame for long life. As being a 10,000 watt generator, still you can start it with electric push start with recoil backup. The big wheels attacked at the bottom of the frame is helpful in moving it around the backyard or inside your house. It has fold down handles which further reduce occupying space which makes it even more portable. Thanks to “Switch & Go” technology, you can easily switch between the two fuel gasoline or LPG while engine is still in operation. This easy transitioning between LPG and gasoline fuel sources make it very user friendly generator. Why You Should Buy Pulsar Products PG10000B16 ? Bottom Line: It is a complete house backup portable generator. Pulsar brands has priced it fairly with respect to feature the unit has to offer. When you need the convenience of portability and the power to perform, the Pulsar PG10000B16 has you covered. Champion 3400 is budget friendly compact dual fuel generator that can power your RV. To make tailgating or camping much easier, this unit comes with RV ready plug that let this inverter generator light up your vehicle. The three position ignition switch with battery included let you quickly start the engine or put it ideal form. Even if it produces 3100 rated AC output, you can still use it in your home as a emergency backup. Such compact generators are easy to carry and very suitable for camping. The state of the art Champion Engine produces only 59 dBA at 23 feet with a frequency of 60 Hz. This “Ultra-Quiet Operation” make Champion 3400 another best quiet dual fuel generator in its category. Like other, it also runs on gasoline and propane and hold 0.6 quarts of oil for low oil shut off mechanism. Champion back this pro-built power house with a 3-year limited warranty and FREE lifetime technical support from dedicated experts. Such great brand support make it value for money generator in the market. Why You Should Buy Champion 3400-watt dual fuel generator? Bottom Line: It is perfect for RV, camping and tailgating. Most customers use it as backup power for home. However, power tool user such as woodworker love to carry it in work space to power equipment. The Firman H03651 produces 3650 running watts of power which is supplied by Max Pro Series 208cc Engine. The efficiency is controlled and maintained by air cooling and auto shut off features. This generator runs on Gas and LPG and comes with built-in LPG inlet for convenience. Fireman H03651 has starting watts of 4550 on Gas and 4100 with LPG. On the other side when engine is all fired up, the 4 stroke engine produce 3650 running watts on Gas and 3300 watts on LPG. When the tank of 5 gallon is full – at 50% load the run time is up to 14 hours. All this feature is carried on 8 inch flat free tires. Fireman brands has their own whisper series muffler which control the noise made by generator and keep it under 67 decibels (quiet operation). The user can monitor the running hours, voltage and frequency with the help of 3 in 1 Data-Minder. Apart from being compact in size, the easy electric start button makes it more user friendly and portable. Why You Should Buy Firman H03651 dual fuel generator? Bottom Line: This is a “Hybrid Series” 3650 Watt Dual Fuel FIRMAN generators that gives you flexibility when out on road. Pick any one of the fuel and your RV or house is backed by continuous supply of 3650 watt of power. 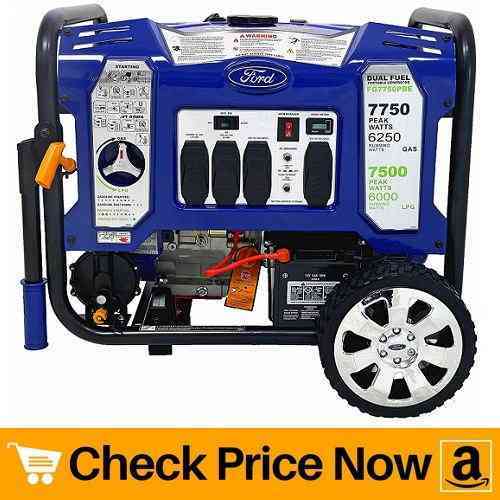 With 6250 rated AC output, you can use this ford dual fuel generator as a home backup power source. The brand authority is backed by 420cc powerful engine which is “Air Cooled” for optimal performance. 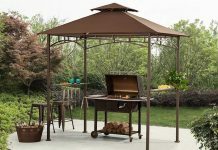 The entire engine and connections is protected under strong powder coated steel frame. If gasoline is your choice of fuel then the engine can operate for 10.5 hours at 50% load. All thanks to its 6.6 gallons of fuel tank. Ford FG7750PBE comes with built-in “Switch & Go Technology” that let user switch between fuels from LPG to Gasoline while still in operation. Gone are the days when people use to pull steel string to start the generator. The package has a installed battery which allows the presence of electric start button. With bigger size comes bigger wheels, Ford FG7750PBE has 10 inch flat free tiers that support the powerful engine. Dragging the generator becomes easy due to the presence of these wheels. Apart from built-in digital display, it is also CARB, EPA, CSA Certified. Therefore, you carry and use this unit across 50 states of United States. Why You Should Buy Ford FG7750PBE Dual Fuel Generator? Bottom Line: Built to Last, Ford Power Equipment. The Ford FG7750PBE dual fuel portable generator produces – Peak: 7750W, Rated: 6250W GAS and Peak: 7500W, Rated: 6000W LPG. Very well built and rigid enough to last decades. Why to use dual fuel generators over gasoline only? The classic generator which run only on gas are wonderful no doubt. However, having an option to generate power by using another type of fuel is not going to harm. Instead people have found that multiple fuel options are great at it make it easy for you to back your home in case of outage. We know that potentially gasoline generators make noise. However, it may not be fun for your neighbor. Always try to prefer the quiet one over other. Because when they are smooth and make less noise it keeps your neighbor happy. Yes, all of the are portable generators with electric start button. It enables you to take them for camping or put in your RV. We found that Champion 3800 is one of the best dual fuel generator for RV and as home backup generator. It is compact and generates enough power to fulfill you RV power consumption for 10.5 plus hours. If you are looking for dual fuel generator for RV then anything which can generate up to 3000 watt is enough. It will keep your RV running on power for around 10 hours. If the need is for good dual fuel generator for home then you might need something bigger than 5000 watt. There are multiple appliances in home which consumes very high amount of power. 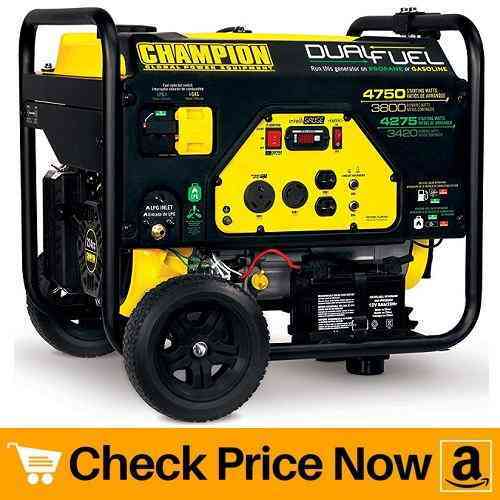 So try Champion generators as they are very popular among buyers. 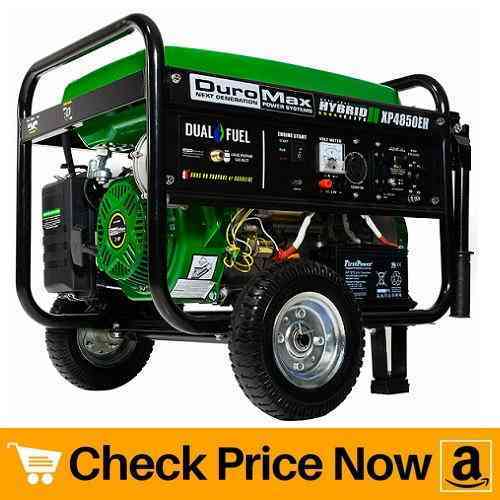 However, we recommend that you choose duromax dual fuel portable generator. Can they provide power to my whole house? If you don’t use large electric space heater or other large appliance then yes, any compact generator with 3000 plus watt can work as backup generator. However, if large appliances are necessary then go for any one of them which can generate more than 5000 watt of electricity. To name a few – Westinghouse WGen7500DF, DuroMax XP12000EH, and Champion 7500-Watt Dual Fuel Portable Generators are best for heavy load. How fuel efficient are they? You can look at the table in the very beginning to check their run time. However, all of them can provide power to your home or RV for more than 8 hours in one refill. Apart from being the backup generator what else can you use it for? 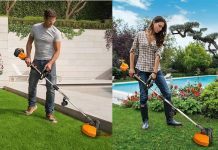 Most people working with power tools or with gardening equipments will love have a portable power source with them. You can use to power electric chainsaw for your woodworking project. “Winter Is Coming” use it to run snow blower that operates on electricity. If you pressure wash your outdoor space or car then such portable generators can be helpful with electric pressure washers. So there is no limit if you need instant stable power supply then these dual fuel generators can be really helpful. To know more about other home related stuff, keep reading HomeStuffPro regularly. Dual fuel generators are becoming one of the house hold necessary. Camping and travelling in RV has caught its trend which increases the demand of such power houses. Pick generators which can run on gasoline or Propane as LPG is now a days easily available. Such compact and portable generators provide us the flexibility to move anywhere in our RV without worrying about power outage. Even at home, most of us now keep a backup generator. And these dual fuel machines can really come handy when you can not find gasoline in your area. Always pick the one which can provide your required amount of power and is portable. Such generators will last long with you and is going to help you during city wide blackout. People living in hurricane prone area must have them as backup power generator. Thanks to the dual fuel feature you will never run out off power during those hard times. If you need a name then Champion 7500-Watt is what you need.